The splendor and charm of ancient Greek civilization is probably the main reason why to consider a Greece yacht charter holiday in Rhodes Island, dubbed as the “sun island” of Greece. 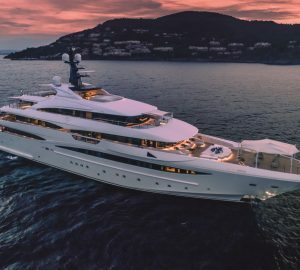 Known in the tourist circuit for its famed Colossus, Rhodes Island is easily a favorite superyacht destination for many yacht charter enthusiasts and holidaymakers visiting the Mediterranean. 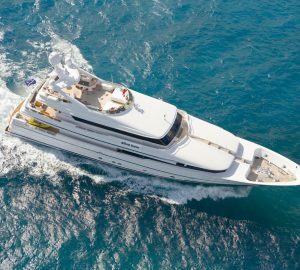 Rhodes has been, and remains to be, an important maritime destination for seasoned sailors and tourists who want to spend their holiday on board Greece charter yacht of their choice. This is mainly because of the island’s strategic location, being just a few nautical miles away from Turkey. There’s plenty of rugged natural beauty wherever you look and with 300 days of the year full of sunshine, Rhodes has been a firm favourite with visitors, painters and writers for many years, each having their own unique experience among its rich cultural heritage and gorgeous coastline. Rhodes Island is one of the more recognizable or familiar tourist destinations in all of Greece primarily because it is the home of one of the ancient world’s greatest wonders, the impressive Colossus, which is believed to have towered the original harbour entrance of ancient Greece. While part of the impact and grandeur can still be seen from the remains of this ancient colossal architectural masterpiece, Rhodes Island is also a favourite destination among sailors and tourist as it is the largest island in the Dodecanese. This eastern section of the Sea of Aegean is where we can find the most number of sailors and holidaymakers on board their luxury yachts. 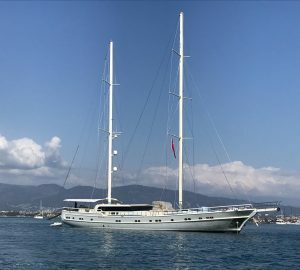 A Rhodes yacht charter on a crewed luxury yacht or superyacht offers a wide range of yacht charter possibilities as it boasts of more than 220 km of perfect coastline, which is one of the reasons why it is an important maritime destination in Greece and why more and more charter yachts are visiting. The City of Rhodes lies on the northern end of the island, where it is dominated by pristine white sand beaches. 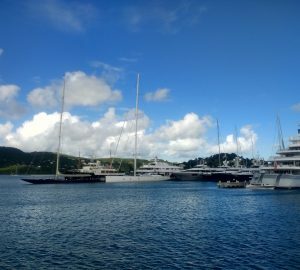 The conditions of the waterfront along the northern section of the island are in stark contrast to that along the southern tip as it is generally dominated by rocky terrain. 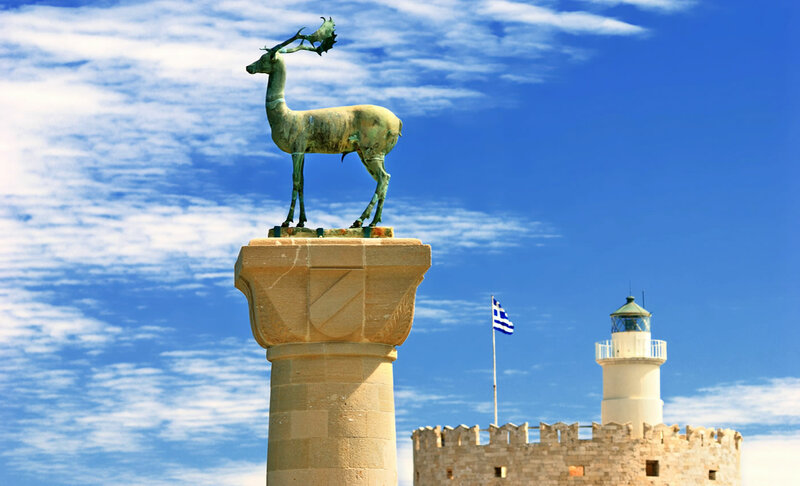 Rhodes Island, easily one of the more popular holiday destinations in Greece, is home to various historical landmarks and archaeological masterpieces. Seasoned sailors and tourists will definitely have their hands full visiting all these places where structures and buildings of historical importance are located. But these activities will only leave you scratching the surface as there are still a lot of remnants of the ancient civilization that are just waiting to be discovered by those who are persistent in their discovery and experience of the glorious history of Greece in Rhodes Island. These ancient ruins and artefacts have links to various ancient civilizations such as that of the Venetians, Byzantines, Turks and Genoese. Amazing relics have been scattered over the island. One of the more famous is the Colossus of Rhodes which was 30m high. It’s considered to be one of the Seven Ancient Wonders of the World. The old walled town lies in the heart of the capital, Rhodes Town. This has been awarded a place on the UNESCO World Heritage List because of its gorgeous palm trees, sandstone architecture and minarets. Don’t forget to pay a visit to the Mosque of Suleiman, the Valley of the Butterflies or one of the Byzantine museums. Everywhere you look, there’s something special to see and lots to do. Rhodes has many hills and low mountain regions covered in green forests with pretty flowers all around. Traditional villages are situated in the hills and it’s here you can have a refreshing drink in a taverna. Try one of the sumptuous Greek dishes and a glass of vintage wine al fresco. The village of Lindhos has its own acropolis while the towns of Monolithos and Kritinia are full of history. Rhodes Island, being part of the archipelago of Dodecanese, offers some of the ideal sailing possibilities for seasoned sailors and tourist spending their holidays in Greece on board rental yachts. 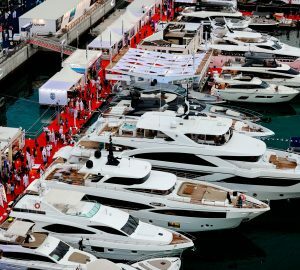 This yacht charter resort is the ideal destination if you want to do some serious island-hopping as you can easily set sail to other important island destinations in a region considered to be the warmest in all of Aegean, which is incidentally in close proximity to Asia Minor. The climate in the area is hot and dry during the summer months and moderate and wet during the winter months. You cannot help but fall in love with Rhodes Island, and if you really want to discover and experience an authentic Greek yacht charter holiday, then your best choice is Rhodes Island. 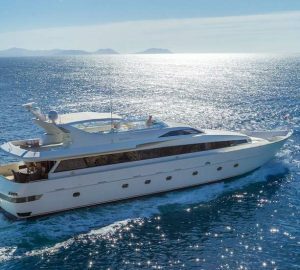 Below is a selection of luxury yachts available in this area. 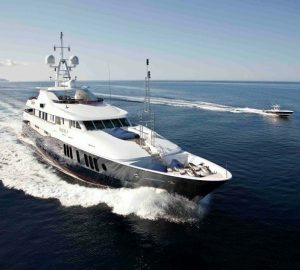 You can view additional Greece charter yachts here or contact us for additional information.